Nicolas Draffin, Art Gallery of New South Wales handbook , 'Prints & Drawings', pg. 109-124, Sydney, 1988, 112 (colour illus.). Sarah Engledow', The world of Thea Proctor , 'The world of Thea Proctor', pg. 16-84, Canberra, 2005, 43, 44, 113 (colour illus. ), 176. Jane Hylton, Modern Australian women: paintings & prints 1925-1945 , 'Modern Australian women', pg. 15-27, Adelaide, 2000, 20 (colour illus. ), 21, 125. Pamela Gerrish Nunn, Women artists and the decorative arts 1880-1935: the gender of ornament , 'Owning femininity: Thea Proctor and the Australian Avant-garde', pg. 73-95, Aldershot, 2002, 79, 82, 83. 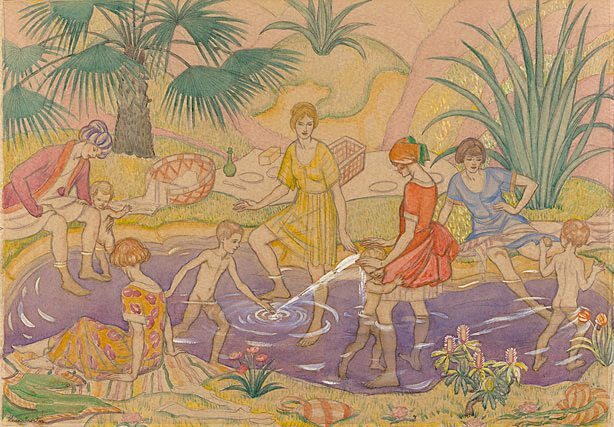 South Australian Society of Artists, Watercolours and Drawings by Thea Proctor , Adelaide, 1925. cat.no. 22. Priced at 30 guineas. Martin Terry, Arts National , 'The Australian landscape tradition in watercolour', pg. 22-27, Hamilton, Nov 1985-Dec 1985, 23, 24 (colour illus.). Modernism and Feminism Australian Women Artists 1900-1940 , Sydney, 1996, 158 (illus.). Illustration 93. Trixie Whitmore, Toxic/Chemical Free Pregnancy & Child Rearing , Sydney, 1991, cover (illus.). Editor Unknown (Editor), The Sydney morning herald , Sydney, 29 May 1935.